Slow speed operation...high speed capacity. The Slow Speed Hammer Mills incorporate the same proven features that have made the High Speed Series 301 Circ-U-Flow the state of the art in circular hammer mills. Top feeding - for highest efficiency. Leading edge of screen creates a breaker plate action for instantaneous grinding action. Airless operation - with dependable gravity feed and discharge. Eliminates the need for a fan or dust collector. Virtually dust-free - because unground material enters the mill as a solid mass with minimal entrained air. And little air leaves the mill. Available in two models - 38" and 44" rotor diameter. 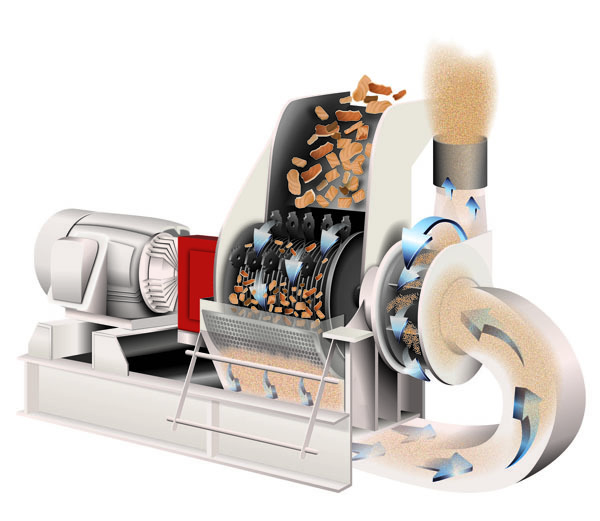 This unique hammer mill runs at a slow 1800 RPM speed for quieter, smoother operation. Yet its capacity is the same, or greater, than high speed machines. Larger total screen area of 1274-2940 square inches is a major factor in assuring high capacity. Screen widths are 13", 18", 24", and 30". Increase in rotor diameter, rather than width, achieves maximum screen area to horsepower applied, and also provides a thinner stream of material to be hammered. The 38" diameter hammer circle at 1750 RPM equals 17,413 FPM. This lower range minimizes fines or powder, producing higher quality, more palatable animal feed. A 30-degree offset internal butterfly valve/spout, controlled by an external lever, directs incoming material to right or left of center, depending on motor rotation. This insures maximum impact velocity for hammer/particle collision. Screen area: 1274 to 2940 sq.in. All models are equipped with LubeSite automatic Grease Fittings. By means of a unique metering mechanism which controls grease flow, these units automatically provide the correct amount and gives a visible check of interior grease level. Screen area: 1440 to 3400 sq. in. Screens are a two-sectioned pinned arrangement type, for easy replacement of either section, and are positioned by a pin and positive lock clamp mechanism for maintaining a perfect 3/8" hammer tip to screen clearance. The frame design is unique in that it has triple access doors for easy screen, hammer or rotor replacement.